Posted on June 29, 2018 at 2:21 pm. In the spirit of the holiday this week, we’re celebrating some of our national treasures. . .that is, national artistic treasures! We’ve gone through our curriculum and have narrowed down seven iconic artworks created by American artists featured in our program to celebrate this July 4th. We’ve also included the museums in which they’re located, in case you want to see them during your summer adventures. So without any further ado, let’s dive in! American Gothic, Grant Wood, 1930. Art Institute of Chicago. American Gothic, Wood 1930. Image c/o the Art Docent Program. This may well be the most iconic American painting, which is why it’s included in our fifth-grade American history unit. 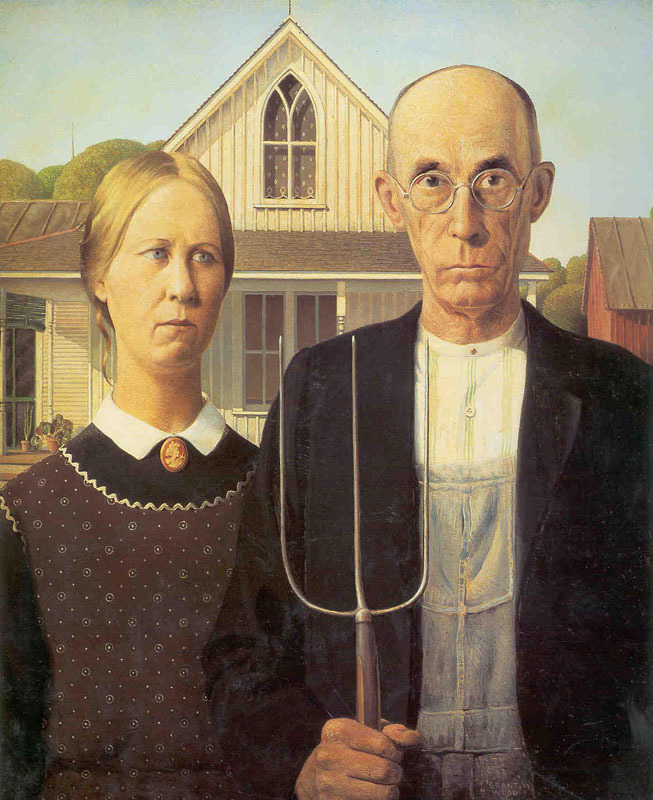 Painted in 1930 American Gothic captures a sort of spirit of the Midwest that no other painting can. The painting features Wood’s sister and his dentist cast as an elderly father and his unmarried daughter, in front of a farm-style house whose window resembles that of a church. Georgia O’Keeffe, Oriental Poppies, 1927-28. Weisman Art Museum, Minneapolis, Minnesota. Pelvis with Distance, 1943. Indianapolis Museum of Art. Oriental Poppies, O’Keeffe, 1927-28 Image c/o The Art Docent Program. 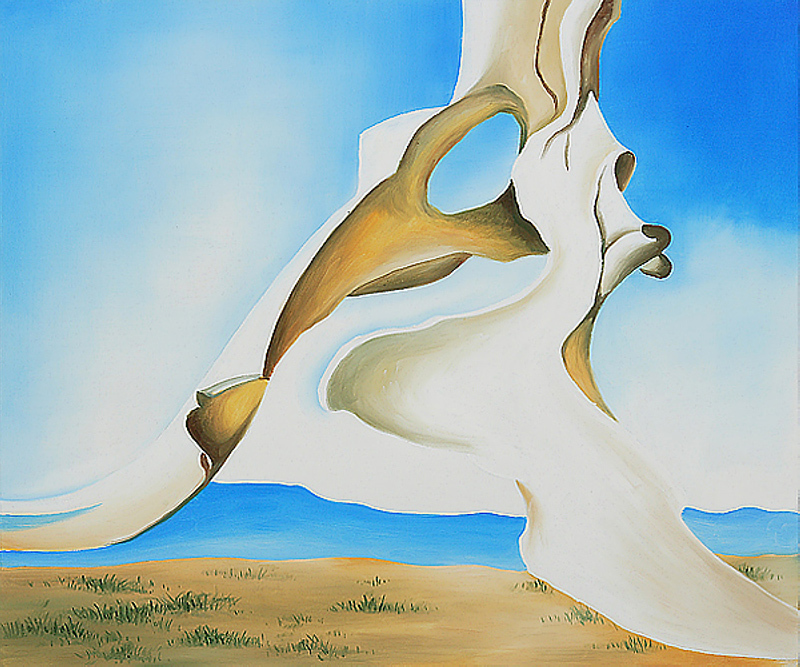 Pelvis with Distance, O’Keeffe, 1943. Image c/o The Art Docent Program. 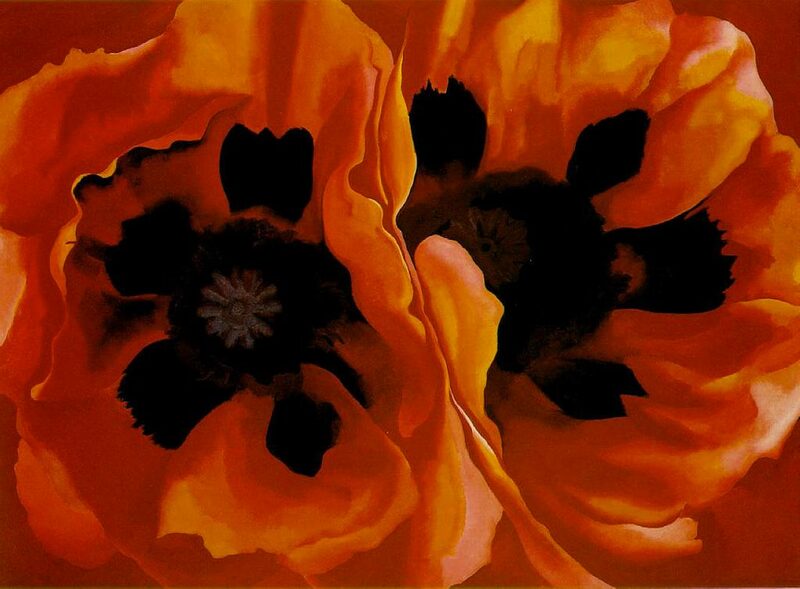 Everybody knows about O’Keeffe’s flower paintings, of which we find Oriental Poppies (featured in our first-grade curriculum) especially dramatic. The warm colors and intense detail are immediately gripping and display O’Keeffe’s prowess of an artist. And since we couldn’t choose which painting to feature, we’re also including Pelvis with Distance (featured in our third-grade curriculum), which at first seems like the polar opposite to Oriental Poppies in terms of composition and color. Yet it’s the same attention to detail across subjects that makes O’Keeffe the prolific artist she is, and is one of the many reasons why we love her work. Portrait of the Artist’s Mother, James McNeill Whistler, 1871. Musée d’Orsay, Paris. 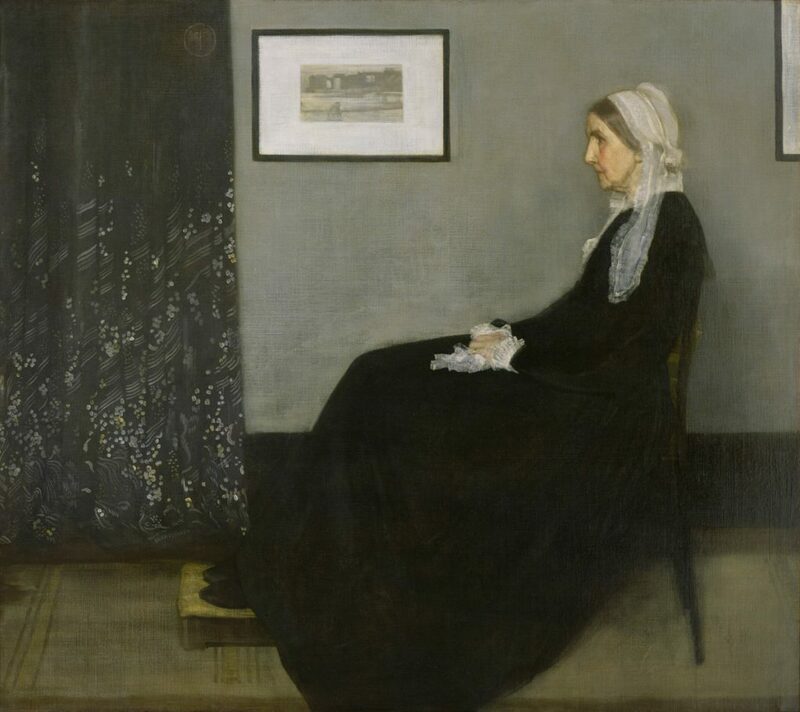 Portrait of the Artist’s Mother, Whistler, 1871. Image c/o The Art Docent Program. It’s famous enough to star in the inaugural Mr. Bean movie, so of course Whistler’s Mother makes our list. Cameos aside, the work, featured in our kindergarten curriculum, is probably one of the most famous works painted by an American artist outside of the United States. The Banjo Lesson, Henry Ossawa Tanner, 1893. Hampton University Museum, Virginia. The Banjo Lesson, Tanner, 1893. Image c/o The Art Docent Program. Featured in our fifth-grade curriculum, The Banjo Lesson is one of the most famous paintings from its time featuring African-American subjects, painted by an African-American painter. 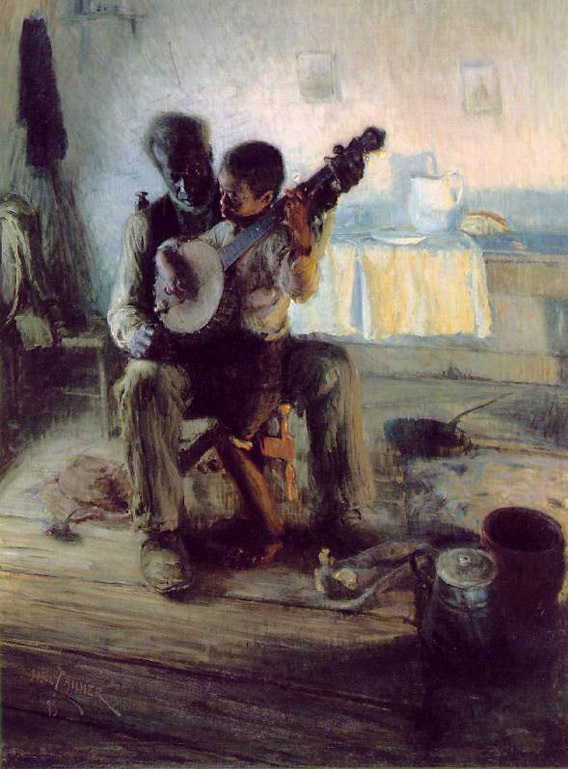 Tanner was the most successful African-American painters of his time, and it’s easy to see why in The Banjo Lesson. The intensity of the man and child’s body language and expressions carry a message of caring, patience, and dignity: something that had been stripped from the banjo throughout American history, as it often became associated with racist caricatures. Tanner not only reclaims the instrument as a symbol of pride from African-Americans, but places us within a specific, tender moment in the lives of his subjects. 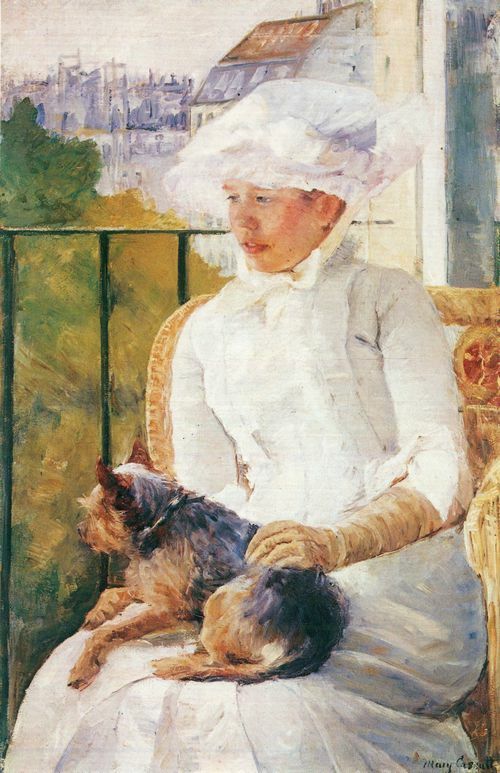 Woman with Dog, Mary Cassatt, 1883. National Gallery of Art, Washington, D.C.
Woman with Dog (Susan on a Balcony Holding a Dog), Cassatt, 1883. Image c/o The Art Docent Program. American-born Mary Cassatt spent much of her adult life in France pushing the limits of Expressionism even further than her contemporaries. She and French artist Berthe Morisot never played it safe when it came to exploring how to create paintings that truly captured an impression of what the human eye sees, in all its messy, tricky glory. Her painting Woman with Dog (also called Susan on a Balcony Holding a Dog), featured in our first-grade curriculum, subtly does just that, blending the Parisian buildings into the background as a human eye would. 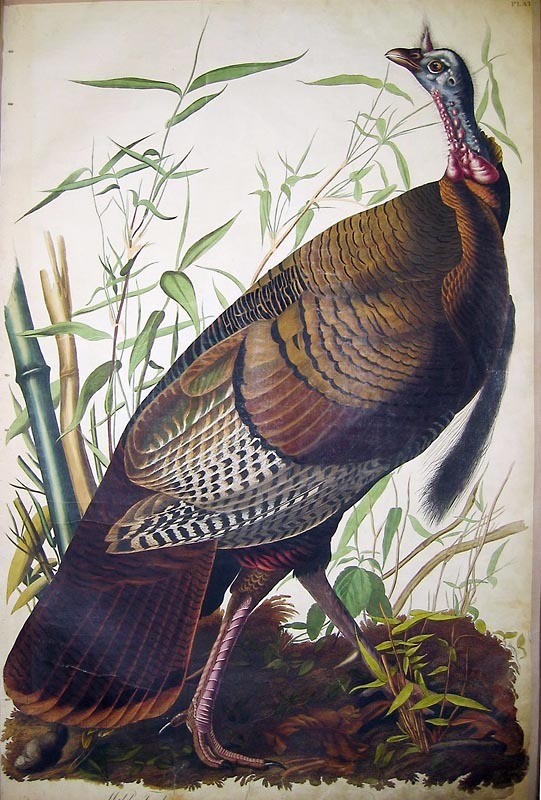 Wild Turkey, John James Audubon, c. 1830s. Originally published in Birds of America, 1838. Wild Turkey, John James Audubon. Image c/o Art Docent Program. Did you know that Benjamin Franklin wanted America’s national bird to be the turkey? Knowing that facts makes Audubon’s illustration that’s featured in our second-grade curriculum pretty patriotic. Audubon cataloged hundreds of species of birds throughout American during his life span and published them in the landmark Birds of America, whose the many illustrations are still relevant today. So much so that The Audubon Society has made the illustrations available online, which you can download for free to print out and hang up, if you’re looking refresh your space. What are your favorite paintings by American artists? Share in the comments below, and have a happy Fourth of July! Discover more about us and our curriculum here! Check out our Facebook page to keep up with what’s new with us! Want more on art history? Check out our blog archives for more!